Liberty Magazine cover with a mom and baby enjoying the beach. Excerpt from “Germany Won the War” by Waverly Root. Published by Liberty Magazine, August 24, 1946. Miniature newspapers like this 1942 Wall Street Journal were issued to armed forces serving overseas during World War II. 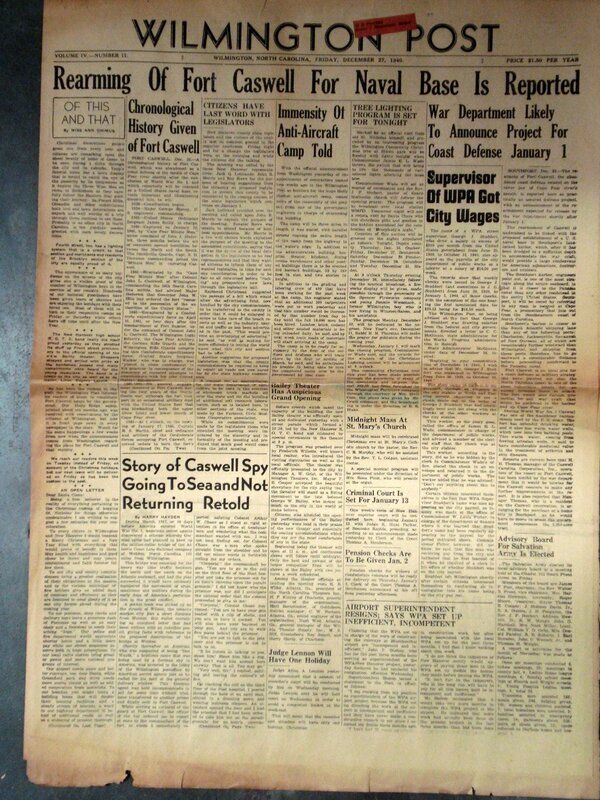 Here a copy of the Wilmington Post announces the Rearming of Fort Caswell on the front page. In 1825 Congress authorized the construction of a fort on Oak Island. The fort was an outstanding engineering accomplishment. It was a pentagonal structure with a two-story citadel and surrounded by a dry moat and a wet moat. Located at the mouth of the Cape Fear River, Smith Island, (Bald Head Island), and the eastern tip of Oak Island, Fort Caswell was a strategic Civil War fortification. 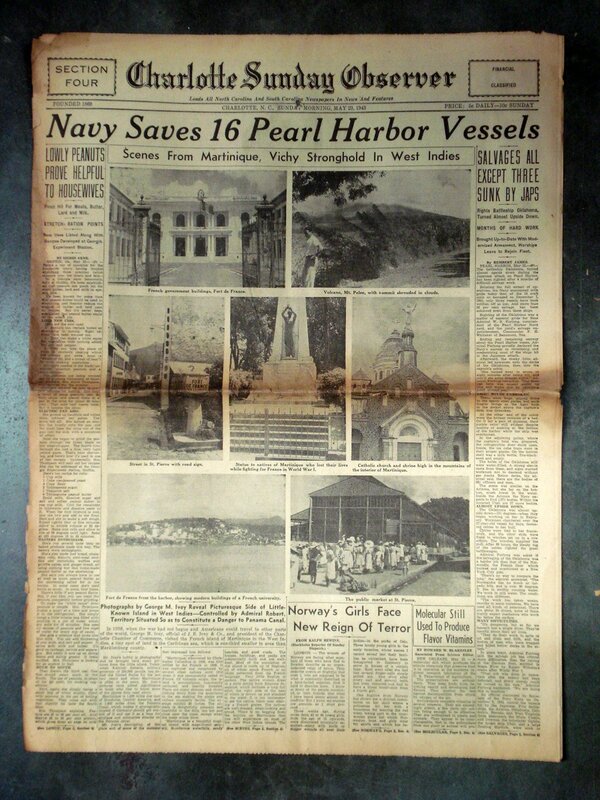 During World War II the fort was re-purposed into a US Naval base. America was preparing south eastern North Carolina for war. Anti-aircraft artillery and sailors swarmed to Oak Island, while civilians worked as enemy aircraft and submarine spotters patrolling the beaches and barrier islands on the lookout for German soldiers and spies. On January 31, 1946, Fort Caswell was designated as war surplus and assigned for disposal. The Baptist State Convention of North Carolina purchased the 250 acre fort from the Government on Sept. 29, 1949 for $86,000. Fort Caswell is now the home of the North Carolina Baptist Assembly. Old headstones made into a fence for the walk along a graveyard in Moravia. We are not sure where these headstones came from. Many of the names carved into this line of stones are written in Hebrew. Presumably, these markers were re-purposed during World War II. Many graveyards in central European towns are several layers thick with bodies of the dead. For example at the Jewish Cemetery in the ancient Prague ghetto people were buried up to thirteen layers deep. There was very little room given to them so they did what they had to do. Should you find yourself in Moravia, we would like someone to make rubbings of the stones. We can then translate them into English to furthur our hopes of tracing the families of the dead. 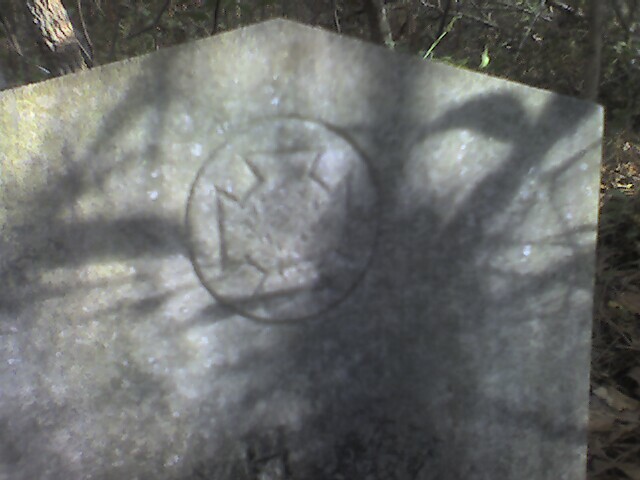 This headstone appears to bear a carved symbol which may be the Masonic Keystone, which is the Masonic mark of an Ancient Grand Master or it may be a Celtic Cross. This photo is part of our investigation into a group of hand-carved grave markers we discovered in the forests of Brunswick County. There are approximately 40 graves in this area. Most of the wooden markers have succumbed to the elements and are only small strips of cedar rising from the ground. Among the rare remaining wood grave markers are two head stones made of carved a light colored rock (pictured above). This ancient cemetery is hidden in the countryside of Brunswick County, North Carolina. This spot is a long-lost memorial we hope to preserve. There are a number of undocumented cemeteries throughout the lower Cape Fear. Mapping and documenting these locations will save local history. If you know of a graveyard like this let us know. This a project Azio Media continues to support.